Emeritus physics professor H. Miller Moseley '43 tackled challenges on and off the field. Don't get H. Miller Moseley '43 started by asking what he thinks about the West Coast offense or the resurgence of trick plays like the hook and ladder. "We used to run all that stuff," said Moseley, an emeritus physics professor who last took the gridiron almost 70 years ago. "It's nothing new." 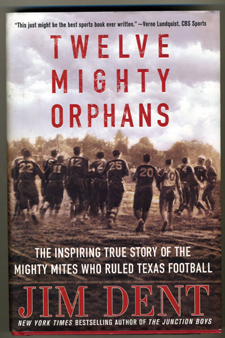 Moseley played football for the Fort Worth Masonic Home back in the 1930s on one of the famed teams recently immortalized in the book "Twelve Mighty Orphans," by The New York Times best-selling author Jim Dent. If the tale of hardscrabble orphans who routinely beat teams that outsized and outspent them sounds a bit like a Hollywood script, it very soon may be one. Dent has already sold the film rights. Moseley's life story is a heroic saga in its own right - beginning with his humble roots on a small farm outside Wichita Falls followed by high school gridiron glory, a physics degree at TCU and a career as a scientist working on a project that changed world history - the atomic bomb. Moseley was 7 years old when his father died from typhoid fever. With his mother unable to support him and his brother and sister, Moseley left the small town of Dundee, outside Wichita Falls, in 1930 and headed to Fort Worth, entering the Masonic Home, founded in 1889 to provide a haven for widows and orphans of Masons. "I remember the first thing they handed me when I got there was a football," he said during a recent lunch at Dutch's hamburger joint on University Drive. "We played just about every hour of every day." Located in Southwest Fort Worth on East Berry Street, the Masonic Home operated as its own school district and began playing football in 1927 when Rusty Russell arrived as head coach. Within a few years, Russell and his Mighty Mites were beating some of the biggest and best teams in the state, including perennial powerhouses from Highland Park, Amarillo and Lubbock. To compensate for their smaller size (the Mighty Mites typically weighed 30 to 50 pounds less than opposing players), Russell created a short passing game - similar to what's dubbed the West Coast Offense popular among today's NFL teams. Thanks to reports by an Associated Press sports writer who knew a good David vs. Goliath story when he saw one, the Mighty Mites gained a widespread following in the '30s and '40s, offering a gridiron equivalent of famed horse Seabiscuit and giving Depression-era America another underdog to root for. The 1938 season, the last of Moseley's career, ended with a heart-breaking 20-6 loss to Lubbock in the state semifinal when a ferocious dust storm bore down on Texas Tech Stadium at the end of the third quarter, making their team's pass-packed offense all but impossible. At a scant 126 pounds, Moseley was too small to be recruited for an athletic scholarship. His playing days were over, but his own comeback was just beginning. A Mason official urged Moseley to apply to nearby TCU, adding he'd help him find a way to pay for it. Moseley was accepted and awarded a scholarship that provided full tuition plus "laundry money." In return he worked 15 hours a week at the university. His first job was answering the telephone for the university's switchboard. "I got a call the first week from someone who wanted Dean Hall. I knew there was Clark Hall, Jarvis Hall, Goode Hall, I didn't know about a Dean Hall so I told them we didn't have a building by that name and they hung up." To his embarrassment, he later realized the caller had wanted Dean Colby Hall, then dean of the university. It wasn't long before he landed a better job - this one in the physics department where he was excelling in a freshman class taught by Newton Gaines, the much-beloved chairman of the department. 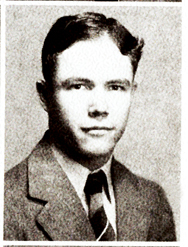 Moseley eventually became a physics and chemistry major, graduating in 1943. He received a fellowship to pursue graduate studies at the University of North Carolina at Chapel Hill, where he began working on a project separating isotopes for the U.S. Navy. Eventually he enlisted in the Navy and began working in the Naval Research Laboratory, then in the midst of a huge World War II push to develop a thermal diffusion process to supply the 235-uranium isotope used for the first atomic bombs. It wasn't until he heard the news reports of Hiroshima and Nagasaki that he learned his group's research had been a pivotal part of something that had changed the course of the war and world history forever. He downplays his involvement, saying "I was just doing my job." After the war, he finished his graduate work then returned to TCU - "to see old friends and find a job." He ended up doing both. Gaines, his former professor, offered him a position teaching and he joined the faculty in the fall of 1950. 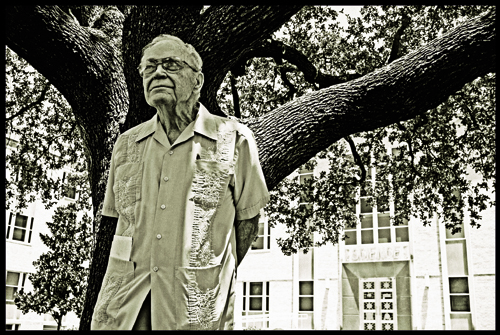 Apart from a sabbatical in 1957-58 at Oak Ridge National Laboratory, he spent close to 40 years teaching at TCU, finally retiring in 1990. He said the university gave him many things - a great education, wonderful friends and even, indirectly, his wife, Doreen. He met her thanks to a former student turned matchmaker. "She was an English war bride and her husband died in 1965," he said. "Her brother-in-law was a friend and former student of mine and he kept trying to set us up. Finally we agreed. We ended up getting married in 1967." The stone face that once struck fear in the hearts of opposing players had a similar effect on many students. "We were a little afraid of him," said Richard Fleming '72 PhD. "He was gruff, but he didn't mean to be. He didn't suffer fools gladly, but he was absolutely the best teacher I ever saw. He'd make complex physics as easy as Mother Goose." C.A. Quarles '60, a former student of Moseley's who was later his colleague in the physics department, called Moseley, "the most organized person I've ever met." "Whenever we adopted a new textbook, he'd work through every problem in the book," said Quarles. "He was meticulous about organizing all his labs, his lecture notes, his books - everything." Fleming, now associate professor of physics at Midwestern State University, remembered how Moseley would chain-smoke Camel cigarettes as he taught, sometimes mistaking his cigarette for chalk and vice versa. He said Moseley was also famous for his humming, which was sometimes so loud it vibrated doors in the Winton Scott Hall. "He's a real character," Fleming said. "The University of Texas and A&M were always trying to hire him away, but he wouldn't go. He was our hero."